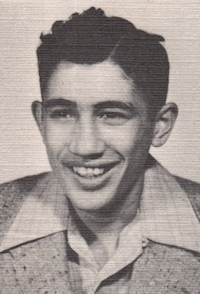 Obituary – Zorba, David Lee Jackie « Perry High School Alumni Association, Inc.
Basketball ’45-’47; Perryscope Staff ’46-’47. 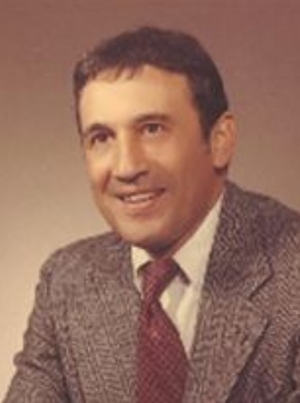 David Lee Jackie “Jack” Zorba, age 85 of Stillwater passed away Thursday morning July 10, 2014 at home surrounded by his family. Jack was born May 9, 1929 in Tonkawa, Oklahoma to Toffick “Tony” & Anna Massad Zorba. His family moved to Ponca City, and then Perry, Oklahoma in 1939 where Jack was raised. He attended & graduated from Perry Public Schools in 1947 where he enjoyed playing basketball during his junior and senior years. Jack began working in his father’s clothing store at the age of 10, stocking and working as a salesperson. After graduation, Jack attended Oklahoma State University, and then returned to Perry to work for his father at Zorba’s Clothing Store. Jack was drafted into the Army on January 16, 1952, going through Infantry, Basic and Combat Engineers at Ft. Leonardwood, MO. He was appointed to attend the US Army Language School at Presidio, Monterey, CA. He was also assigned to the US Army Infantry Center as an Interpreter and Translator in the Danish language. Jack finished his tour of duty at Ft. Benning and was honorably discharged on January 14, 1955. After discharge he returned to Oklahoma State University where he graduated in 1959 on the Dean’s Honor Roll and obtained a Bachelor’s degree in Business Administration. Once again Jack returned home to Perry to work in his families clothing store. There he met and married Joyce Allen Yandell of Perry on November 5, 1961. After marriage he and Joyce moved to Stillwater where they opened & operated Zorba’s Menswear, an upscale Men’s clothing store in downtown Stillwater for the next 14 years. After selling the store Jack and Joyce began selling real estate before retiring. Family was very important to Jack. He enjoyed spending time with his children, grandchildren, and extended family. Jack was an avid golfer. He also enjoyed the outdoors, hunting, fishing and especially training his own bird dogs. He loved his heritage deeply. Always enjoying it when Joyce would fix a big pot of grape leaf rolls, meat pies. humus, tahini or any other dish that would reflect on his Lebanese roots and remind him so much of his mother. A vacant place now rests at the Zorba’s. With his recliner empty we are reminded of who Jack Zorba really was. His honesty and integrity, a great sense of humor, his faith in God, and above all, his contagious smile. Jack was a true Pokes fan, always taking pride in OSU sports. He will be greatly missed by so many. It’s a fact, there was only one true, “JACK ZORBA”. Jack is survived by his wife Joyce, of the home, son Chad & Cindy Zorba of Flower Mound, TX, daughter Jill and Ronnie Dighton of Broken Arrow, OK. Grandchildren Austin Zorba, Andie Zorba, Cody Zorba, Jace Zorba, Nathan Zorba, Haley Vermillion, Hannah Dighton, and Hope Dighton. Nieces & Nephews: Judi Zorba Clark of Dallas, TX, Dana Walton Fore of Ft. Worth, TX, Keri Walton Gilbreath of Ft. Worth, TX, and Michael Zorba of Norman, OK.
Jack was preceded in death by his father, Toffick Zorba 1978; mother Anna Zorba 1984, brother Rudolph Zorba 1996, all of Perry. Special thanks to Judith Karman Hospice of Stillwater, Dr. Daniel Hill, and other family and friends who have been so helpful during Jack’s brief illness.